At this time of year, with Canadian thanksgiving in October and American thanksgiving in November, the theme of thankfulness is in the air. The recent change in Babaji’s health (see Baba Hari Dass updates on SSCY’s website) is an additional reminder to reflect on the gifts we’ve been blessed with. Of the many, many things I have to be grateful for, my meeting with Babaji is at the top of my list. At the time, I didn’t understand how that would change my life. I wasn’t looking for a guru, didn’t even consider myself a spiritual seeker. However, something happened then that I didn’t understand till much later. I’ve told the story of my first meeting with Babaji many times; all of Babaji’s students have stories of their first meeting with him, and in every case, it seems something magical happened. When we – that is, Babaji’s early students from the Vancouver area – began to form as a group, we became a family. It wasn’t all peace and harmony, but it was family; we had a lot to learn and many edges to wear away. What’s striking is that we kept doing it, whether we agreed with each other or not. There was an underlying trust that this was what we were meant to be doing. Perhaps others had a clearer sense of direction than I did; I was happy to be part of this satsang family and do what we were doing because it gave me a sense of purpose. Babaji said to hold a retreat, so we did. That was enough. If you have faith in a person who is on the spiritual path, whose life is a model for you, whose teachings are acceptable to you, whom you can trust, and for whom you feel devotion, that person is your spiritual teacher. Babaji taught us to be karma yogis by his very being. He taught, worked, played when each was called for. He encouraged us to learn, work, practice and play, prodding us when we needed it but otherwise trusting that we could do our part. The aim of life is to attain peace. A guru or spiritual teacher teaches how to attain that peace. A guru doesn’t teach much except how to live in the world with truthfulness, with nonviolence, and with selfless service to others. The guru either presents these teachings in words or through the way they live their life. I can’t truthfully say that I always followed Babaji’s direction, but when I didn’t, I eventually found out that I could have saved myself a lot of trouble if I’d listened to him in the first place. Listening and learning take time to develop. The teacher’s role is to show the right path for attaining peace and to point out that another path goes in the wrong direction. In both cases you have to walk by yourself. 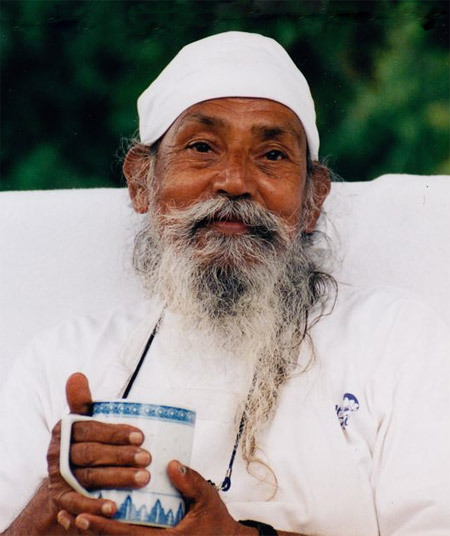 Babaji has been patient with us over the years, answering the same questions for 40 years, often with a smile on his face. He could be tough when it was called for, but always with love. He kept reminding us that we had to do our own work. He could point us in the right direction, but we had to walk on our own. The most important thing is the perfection of aim. When you are determined to attain God, then all your work will start channeling toward God. Your garden will be God’s garden. Your hiking will be for God. Your family will be God’s family. The ego of me and mine will disappear. Whether you work for your family or for society does not make any difference because it is also God’s work. It’s in your hands to dance or to sit. If you feel like dancing then dance. If your aim is firm everything is for God. In dancing you’ll dance for God, in working you’ll work for God, and in meditating you’ll meditate for God. Devotion to a teacher is to respect and love that teacher. Attachment gets so dense that a person doesn’t feel the difference between God and guru. And truly they are not different. Babaji reminds us: All answers are inside us and we have to realize them by ourselves. When one realizes that knowledge can be attained through one’s own sadhana, one’s own Self becomes the guru. Everything becomes clear step by step. My life has been affected in every way by having met Babaji all those years ago, and I am eternally grateful for this gift. My job – our job – is to keep walking the path of faith, devotion and right aim. 7 thoughts on "Honouring the Teacher"
Thanks for that. So very true. Life changing. So fortunate. Lovely, Sharada. Thank you for so eloquently reminding us of what it’s all too easy to forget! Sharada, a lovely written piece. I’ve been thinking of Babaji every day this last while and your writing reminds me to pause and give thanks for being born into a life with him in it. Jaya Ram!!! Thanks so much, Sharada. Even just the picture of Dear Babaji with his teacup, the look in his eyes, tells a thousand beautiful words. Seeing this picture and reading this October post brings a flood of amazing memories to my mind. It has been many, many years since I was at either Salt Spring Center or Mt Madonna and visited with you all. In fact things have probably changed there quite a bit. BUT I have always continued to carry these times and experiences with me, and have been thinking a lot of Babaji as he has entered this time of health challenges and elder age. His steadfastness, his patience, his wisdom, his atunement to physical fitness, his love of play, and even – pranks! – all have been major influences and guideposts for me. So, you see, what a master! So many ways to teach and learn. I will never forget him. Yes, that is stating the obvious, but there it is! Thank you, Sharada, for putting into words what so many of Babaji’s students feel. And also for the deeply meaningful quotes. Thank you Sharada. I basked in your writing that reflects the pool of which we are all a drop.